A little while ago I was contacted from maxnina.com which as I later found out is a great online clothing store! And you know what? I really like what I have found, because I think you can see a wide variety of garments and accessories that are up to the latest trends. From what I have seen this shop sells wonderful selection of dresses. I think it’s very easy to find a dress for every occasion starting from really cheap wedding dresses (if I ever get married I’ll where at least to start looking), also very nice evening dresses (how gorgeous is this one? ), to even homecoming dresses for year the of 2013! photo above you can see my favorite picks). The jewellery is very cute and really cheap! And speaking of prices, I think in this online boutique the prices are reasonable and affordable. I am definitely going to browse around for a while in their shop! Such a stunning collection of jewellery, my favourite has to be the yellow piece followed by the second earrings, beautiful! Nice selection. The earrings are my favorite pieces. Didn't know that store but they seem to sell really cute accessories! Loved the earrings you chose! Oh the necklaces are the best part of your choices! I think the necklace with the birds is awesome… also love the starfich ring ! Those are gorgeous! I love those earrings in the first row! 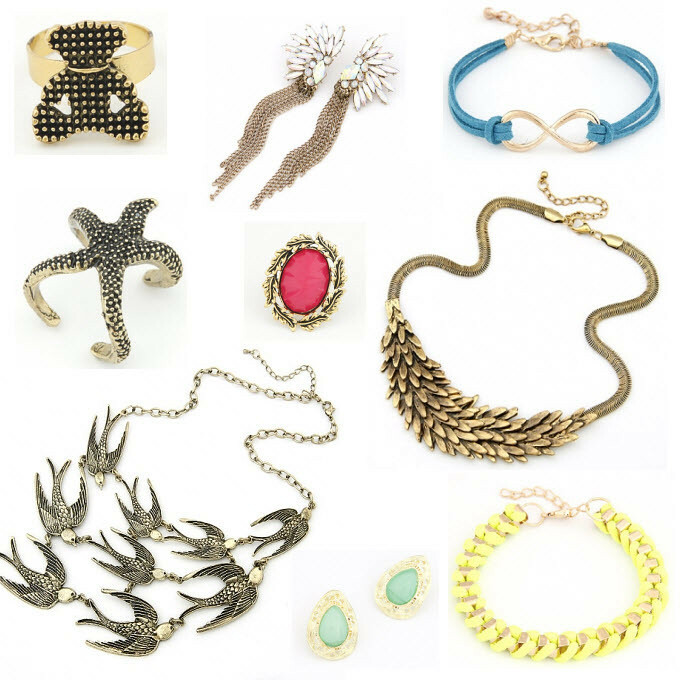 Stunning pieces! Beautiful jewellery, love the bracelets especially! Perfect post… amazing stuff… love each piece! great stuff! can't choose my favorite! love everything ! Im in love with this ! !